The Park Theater Company: St. Louis Park’s Community Theater performs The Illusionist: Shakespeare Reveals All by Jerry Wilson, local playwright, entertainer, and publisher. 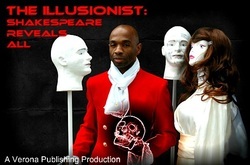 Jerry Wilson writes and directs his original play The Illusionist: Shakespeare Reveals All which explores the tantalizing and seductive emotions and intricate musings of the world’s most famous bard as he creates his prose and poetry. Wilson has expanded his play to include Shakespeare’s nemesis, Christopher Marlowe.